ION Audio has introduced their new waterproof iPhone speaker dock in the form of their newly created Water Rocker. The new Water Rocker speaker dock has been designed for use near water and allows you to relax in your pool and listen to media knowing your iPhone is safely protected from dreaded water damage. 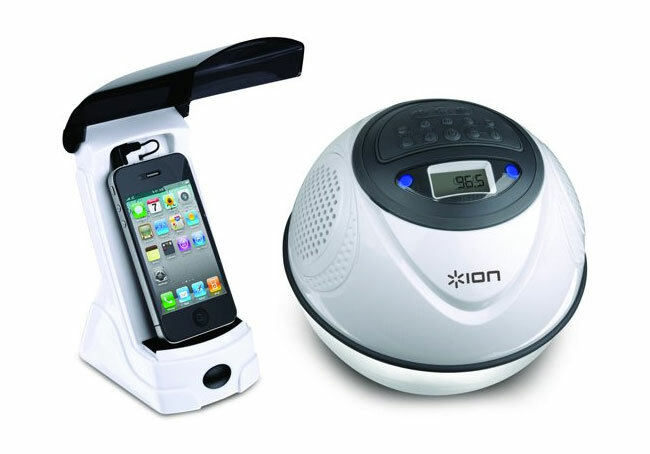 The ION Water Rocker system is made up of two components the iPhone dock and the waterproof speaker. Once docked your iPhone can stream music up to 150 ft away from the speaker keeping it out of harms way. One iPhone dock device is also capable of streaming music to a maximum of 9 speakers all at once, allowing you to project your sound over your pool area no matter how big it maybe. Unfortunately no information on pricing or worldwide availability has been released as yet by ION, but as soon as information comes to light we will keep you updated as always. However the ION Water Rocker will be showcased at the Summer NAMM 2011 show.